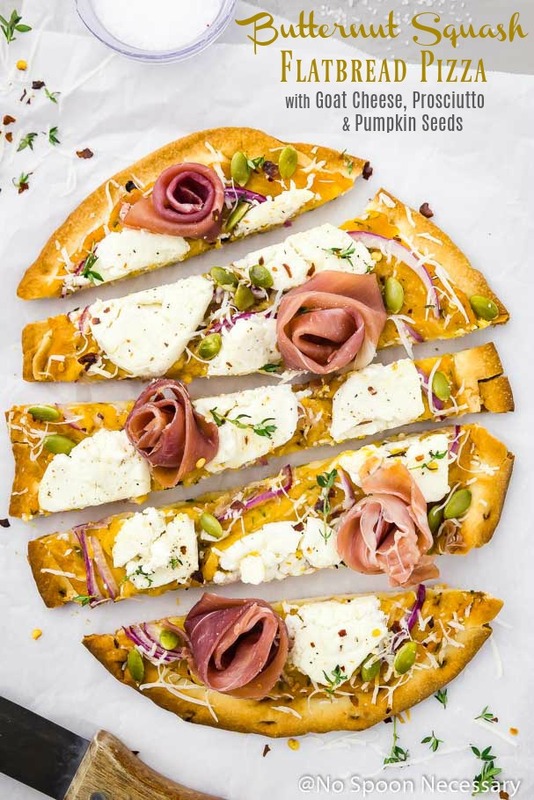 Give pizza night a fresh and delicious autumn twist with this easy Butternut Squash Flatbread Pizza! 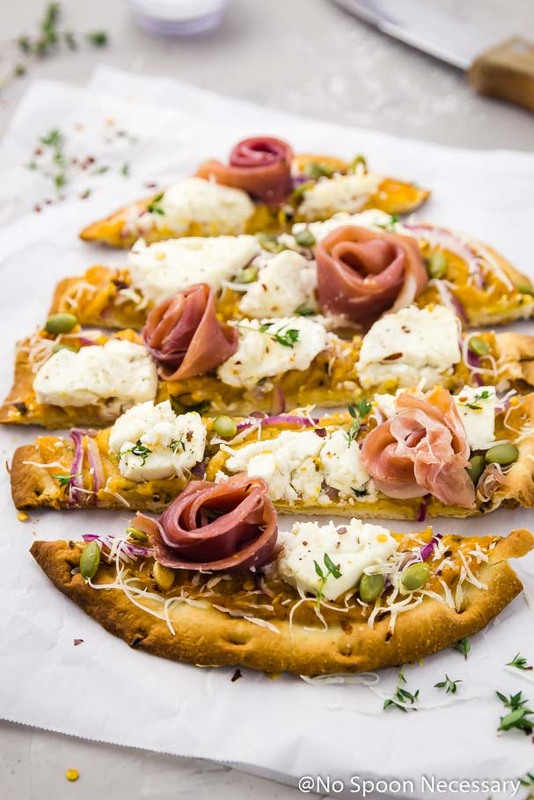 Crisp and chewy naan bread topped with creamy roasted butternut squash puree, decadent goat cheese, pungent red onions, salty prosciutto, crunchy pumpkin seeds and fresh thyme, these pizzas are guaranteed to please! This post was originally published in January 2017. I made edits to the photos and added a RECIPE VIDEO to show you how easy this is to make! However, the actual written words below in this post remain the same. Hi, friends! Happy Thursday! Ohhhh-soooo close to the weekend! If you have been visiting my little slice of the interwebs this year, you may be noticing a theme happening here – Dishes that are quick, easy, and 10 ingredients or less has been the name of my 2017 food game. I’m going to be honest, my culinary school background kind of ruined simple, no-fuss meals for me. BUT, one of my New Year goals has been to resist the urge to over complicate the dishes here on this blog. You see, in school the Chefs were always handing us recipes with no less than 25 ingredients. They were constantly ingraining into our minds the importance of flavor profiles and balanced dishes. Basically, I learned that more is better when it comes to flavor. But, this year I am trying to practice something else I learned in school. Something that pretty much goes directly against everything else we were taught – to K.I.S.S (keep it simple stupid). While I have been working REALLY hard to keep most recipes here quick and easy, unfortunately they can’t all be one skillet and 16 minutes or less (like these shrimp). Some meals are just worth the extra effort and/or ingredients. Ya dig? All that ⬆️️ rambling brings me to today’s recipe. While it is not super quick, it IS relatively easy. And pretty much all of the cook time is hands off. AND, this recipe IS only 10 ingredients! Therefore I’m going to call this a WIN WIN. Win for you in the easy department. And win for me in the staying true to my New Year, New Me goals department. Buuuuuut, before we get to the recipe I have a super quick confession – I made and photographed this pizza back in October. And I’ve made it about a dozen times since. Did you just throw something at me? Thankfully I have my trusty computer screen to protect me from rocks and other hard objects. Before you write me off for life, I had EVERY intention of sharing this way back when. And then the holidays happened, and I became completely CONSUMED in all things festive and fun. But, what matters is that I AM sharing it NOW. Hopefully you make this pizza, because I know you will forgive me after just one bite. This pizza is all about the toppings and layers. Layers of straight up FLAVA HEAVEN, you guys. Now that we have discussed how downright delicious this pizza is, let’s talk about how it all goes down. 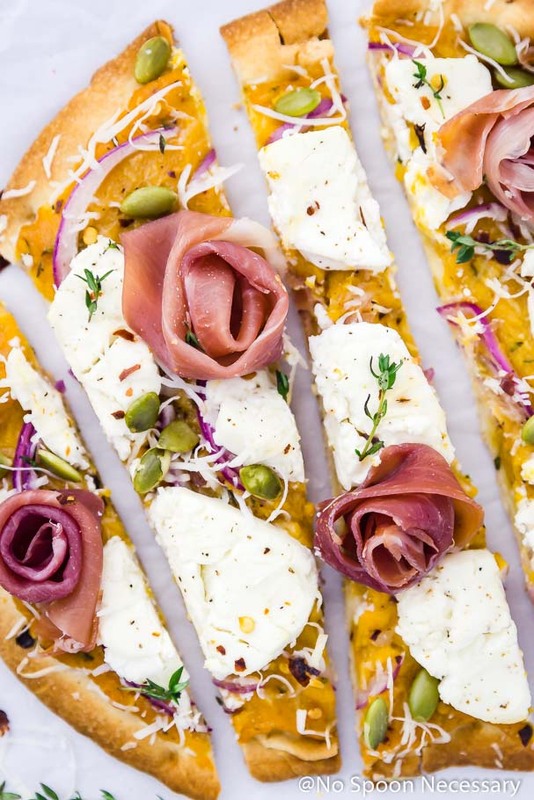 The most time consuming part of this flatbread is the butternut squash puree. But, it only takes 20-30 minutes and whipping it together is SUPER EASY. Simply throw some diced squash onto a baking sheet with a few cloves of garlic, a sprinkle of chili powder and thyme, and a drizzle of oil. Then, roast until tender. Transfer the squash and garlic to a food processor with a bit of honey and puree. Done and done. 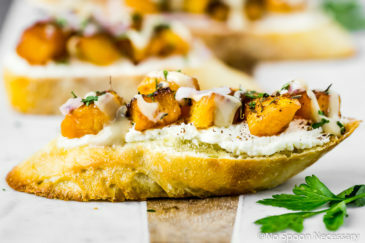 Generously spread the butternut squash puree on a piece of naan or flatbread and top with red onion, goat cheese and parmesan. Bake until golden. 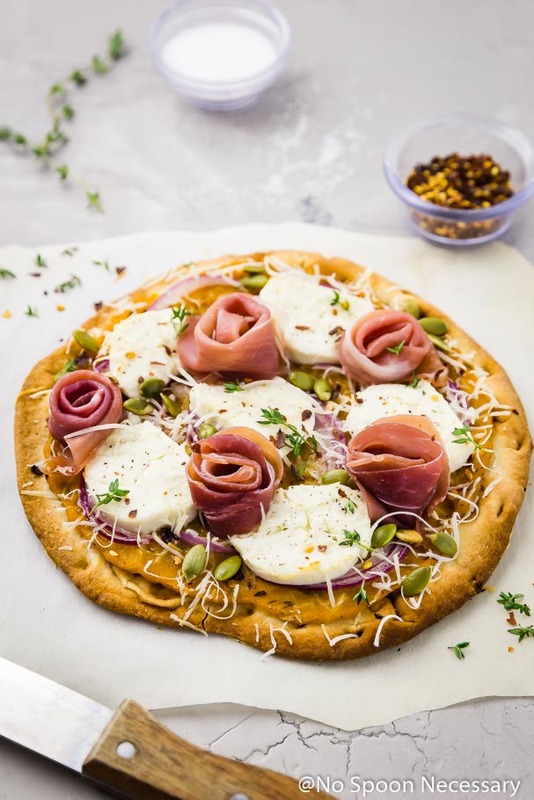 Remove the pizza from the oven and garnish with prosciutto, fresh thyme and pumpkin seeds. 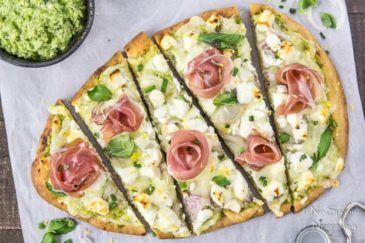 I have used plain naan, garlic naan and flatbreads to make this pizza and all of them are delicious. You can make your own pizza dough and use that as well if you would like, just be sure to par-bake the pizza dough before adding the toppings. Instead of using 2 pieces of naan or flatbread, you can make one large pizza if desired. 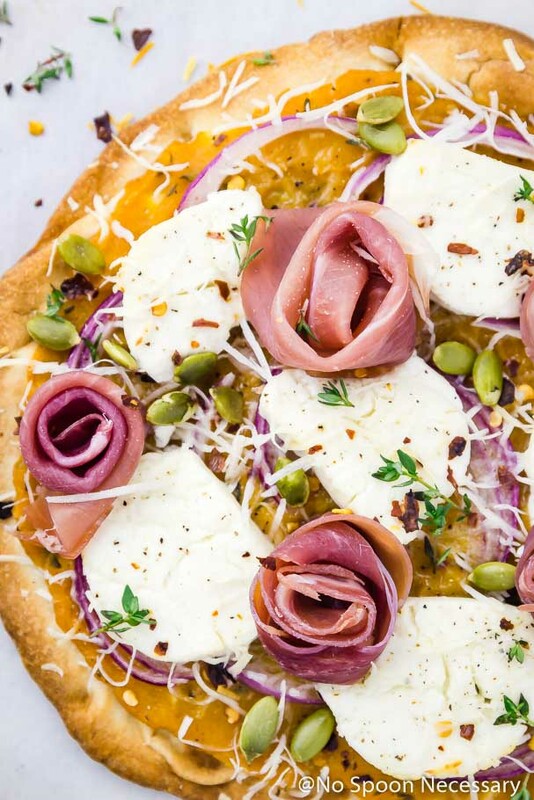 If you want your prosciutto to be crispy, simply add the prosciutto to the pizza with the red onion and goat cheese and bake as directed. 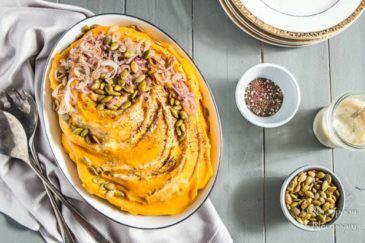 The butternut squash puree can be made up to 4 days in advance and stored, covered, in the refrigerator. Pizza night deserves a delicious upgrade. 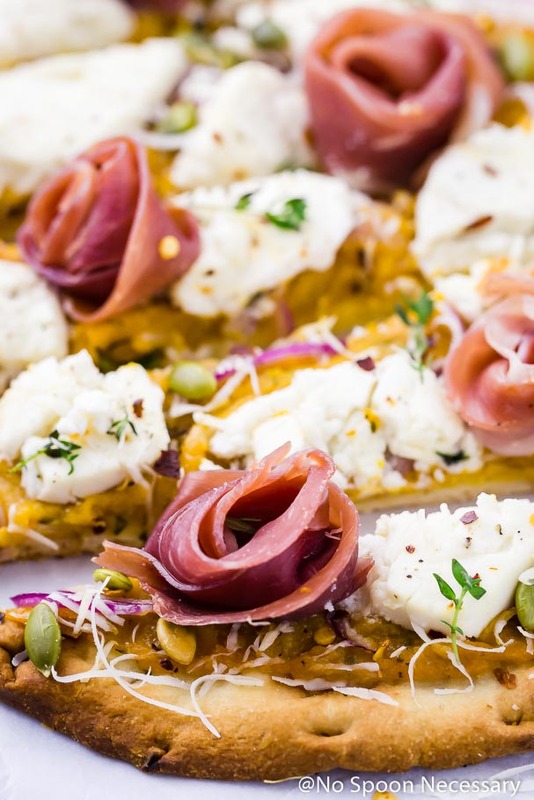 Add this easy Butternut Squash Flatbread Pizza to the rotation! Until next week friends, cheers – to easy, yet elegant pizzas! 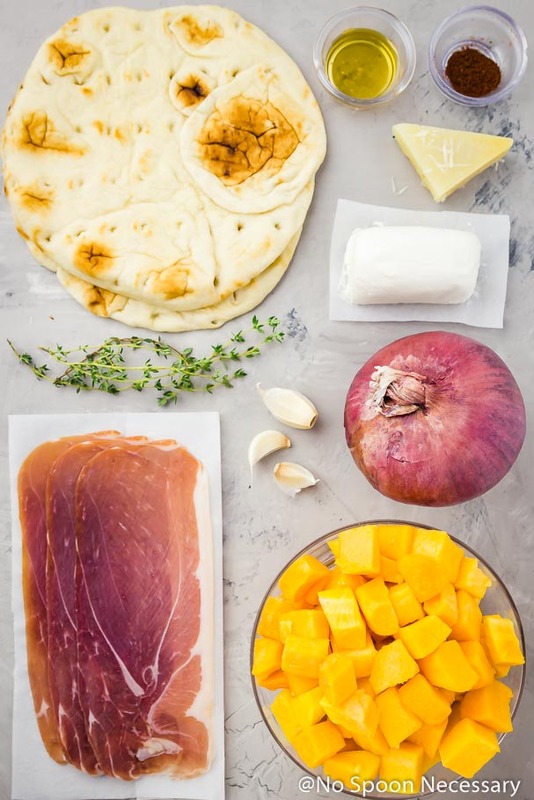 Give pizza night a fresh and delicious upgrade with this easy Butternut Squash Flatbread Pizza! 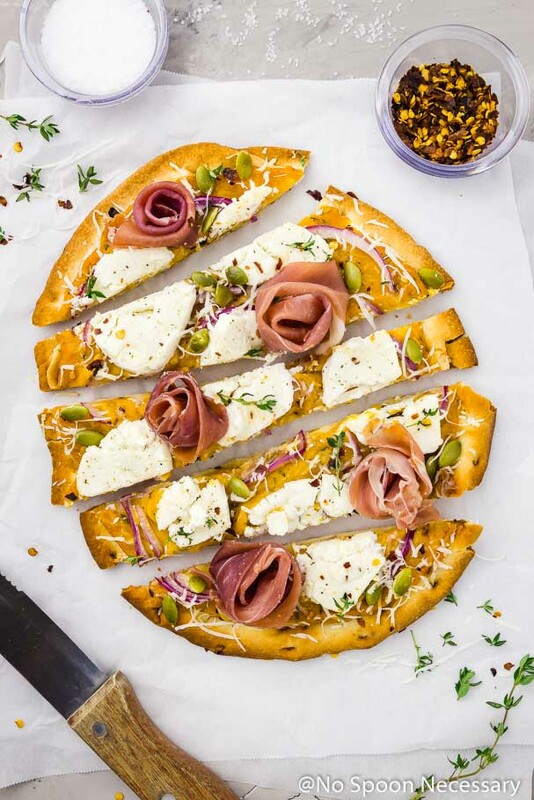 Topped with decadent goat cheese, pungent red onions, salty prosciutto, crunchy pumpkin seeds and fresh thyme, these pizzas are guaranteed to please! Preheat oven to 400 degrees F. Line a baking sheet with aluminum foil for easy clean up. Add the squash and garlic to the baking sheet. Drizzle with 2 tablespoons of olive oil and sprinkle with thyme and chili powder. Season generously with salt and pepper. Toss to combine. Roast squash in the oven until fork tender, about 20-30 minutes, tossing halfway through cooking. Make the squash sauce: Transfer squash and garlic to a food processor. Add in the remaining tablespoon of oil and honey. Puree until creamy and smooth, adding more olive oil (or vegetable broth or water) if it’s too thick. (You want it creamy, smooth and spreadable, but not too thin). Taste and adjust for seasoning with salt and pepper and sweetness with honey. For the Pizza: Place naan on a baking sheet. Spread with a heaping 1/3 - ½ cup of the squash sauce. Top with red onion, goat cheese slices and parmesan. Bake for 13-15 minutes, or until golden brown. To serve: Remove from oven and top with prosciutto, fresh thyme and pumpkin seeds. Serve immediately. Enjoy! 1. I have used plain naan, garlic naan and flatbreads to make this pizza and all of them are delicious. You can make your own pizza dough and use that as well if you would like, just be sure to par-bake the pizza dough before adding the toppings. Instead of using 2 pieces of naan or flatbread, you can make one large pizza if desired. 2. If you want to make prosciutto roses like you see here, simply take a small slice of prosciutto and wrap it around your finger. Voila. Prosciutto Roses. 3. 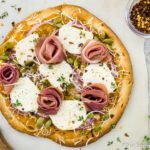 If you want your prosciutto to be crispy, simply add the prosciutto to the pizza with the red onion and goat cheese and bake as directed. 4. 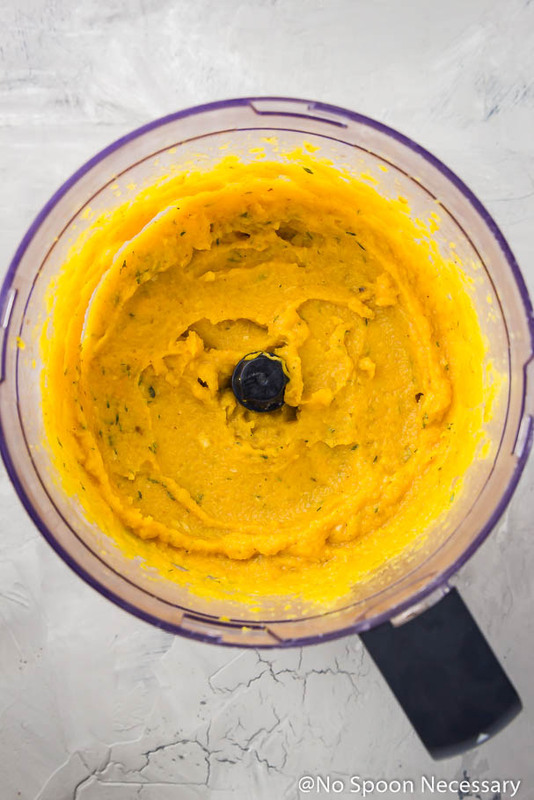 The butternut squash puree can be made up to 4 days in advance and stored, covered, in the refrigerator. It was a good year for squash (and pumpkins) here. Now to preserve them. Your recipe convinced me to pressure can some in pints for the sauce. (freezer is already full). Preserving squash and pumpkin is an excellent idea, Nancy! 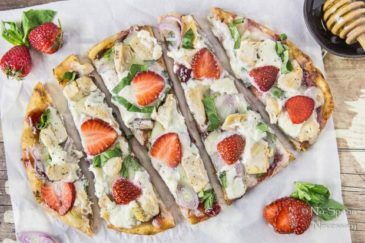 If you use some of your preserved goodies to make this pizza, I hope you enjoy it as much as we do! Cheers and thank you so much for stopping by! Too pretty to eat with those fancy flowers! Not, I love all the yummy salty flavors going on in here and it reminds me of our summer trip to Italy. Yes!